Added on March 5, 2019 by Alex Mirutziu. The Center for Contemporary Art (CCA) presents “Gaining in a State of Debt”, the first solo exhibition by Romanian artist Alex Mirutziu (1981, Sibiu, Romania. Lives and works in Cluj-Napoca, Romania). His exhibition at CCA Tel Aviv features a new performative work, entitled Bottoms Know It, and a compilation of videos that contextualize the new work and at the same time open up new avenues of understanding. Conceived for CCA Tel Aviv and featuring three performers and three props, Bottoms Know It exposes what may come across as being implicit but unnoticed, which is not necessarily a feature of truth-making. 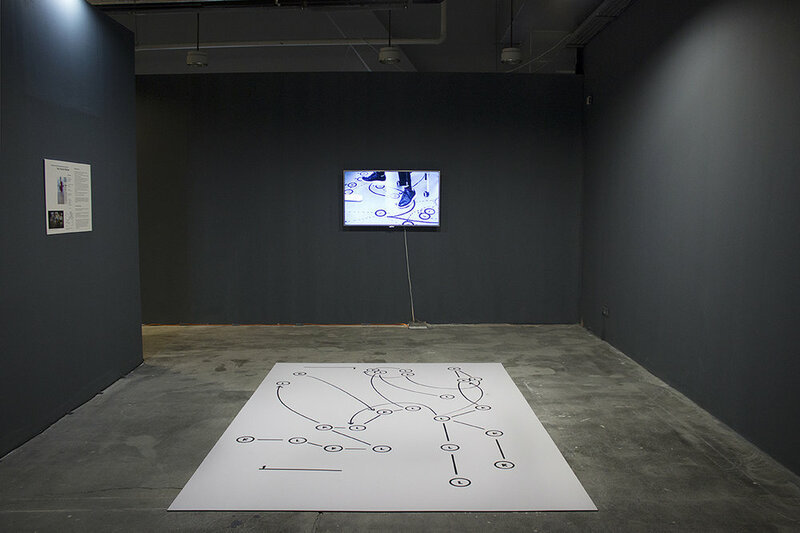 Through the combination of different streams of thoughts and informed by philosophical concepts that are always personalized and freely interpreted, the artist is capable of creating time-based and durational experiences between himself and the viewer, using the artwork – whether in the form of an object or a body (his own or somebody else’s) – as a channel, a catalyst, a sort of remote controller that is linking two individuals, himself and the viewer, possibly located in two different geographical and time zones. However, all the aforementioned notions never come as we usually expect them: “time-based” should be considered according to an unusual notion of time; “durational” should be perceived according to a larger scope of perception. The work of Alex Mirutziu not only makes us think, it also makes us think about the conditions allowing us to think, and un-think, to do, and un-do. Dignity to the unsaid, 2017. HD video, 17:42 min. Word workers: Alex Popa, Irina Sibef, and Cosmin Stănilă; director of photography: Alexandru Don; camera assistant: Victor Merca. Commissioned by Marie-Laure Fleisch Gallery, Brussels. 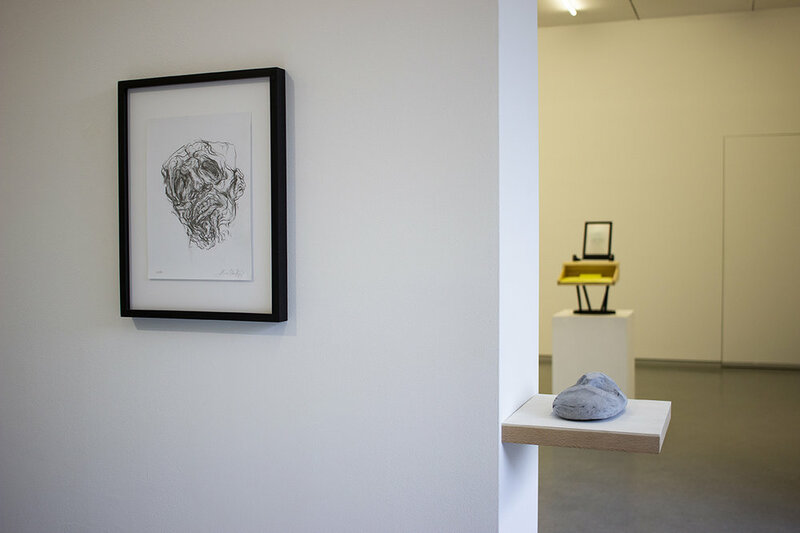 Courtesy of the artist, Galeria Sabot, Cluj-Napoca, and Galerie Rüdiger Schöttle, Munich. “Alex Mirutziu: Gaining in a State of Debt” is curated by Nicola Trezzi in close collaboration with the artist. 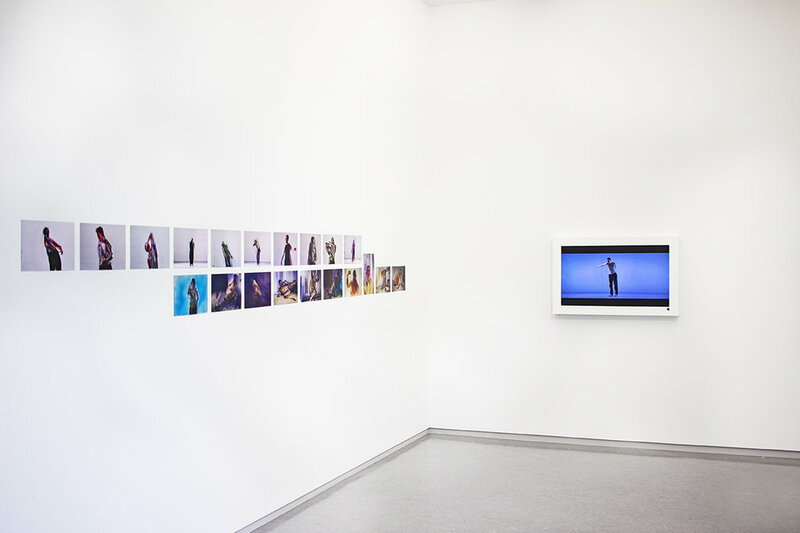 The exhibition is supported by Invitro, the OUTSET Residency in Tel Aviv, and the Romanian Cultural Institute – Tel Aviv. Additional support provided by Galeria Sabot, Cluj-Napoca and TAROM. Added on December 11, 2018 by Alex Mirutziu. 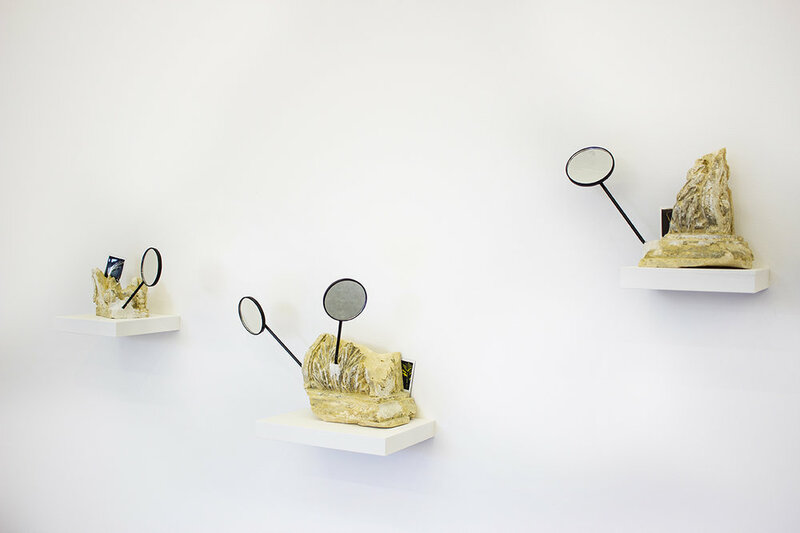 Alex Mirutziu’s practice extends over a wide range of media and activities, including sculpture, drawing, poetry and performance as well as critical and curatorial projects. In his work he expands on the notions of approximation and proximity in connection to time, dislocating modes of arrival at meaning. In his practice he seeks to facilitate the role of the body as “turbulent performative occasion” taking inspiration from the poetic of homelessness and invisibility in order to suspend the set-ups of doing, un-doing, thinking and un- thinking. Alongside TAH29 (The Artist and Himself at 29) he activates a collective whose modus operandi is retroactive irony. 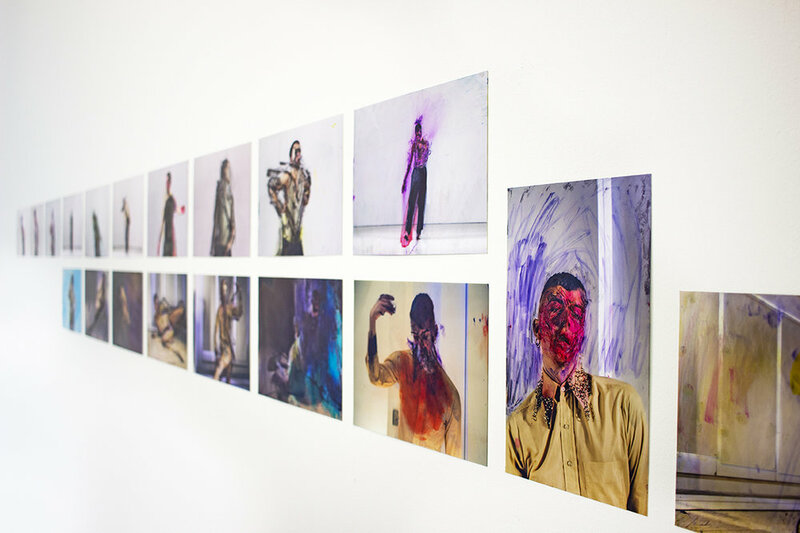 As part of his theoretical practice the artist frequently collaborates with artists, writers, musicians, designers and philosophers such as Grit Hachmeister, Elias Merino, Graham Foust, and Graham Harman. For this specific work, he activated a collaboration with actor Pär Andersson, through which the artist questions the nature of the politicized model of reading and the cultural privileges of lineage, complicities of the edges with which the words cut, to create a new narrative which is beyond doubt and curated by Sweden Sans, the typeface created by the Swedish design agency Söderhavet. 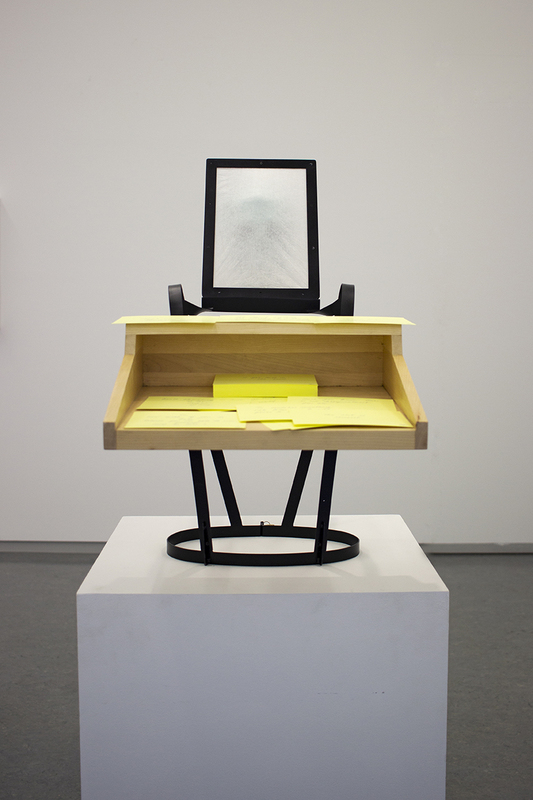 Mirutziu and Andersson engaged with a fragment of Prepared poem #2 – a project that Mirutziu started while in residence at IASPIS, Stockholm in 2014-2015 – part of a series titled Bureaucratic Objects, which comprises fragments from Graham Foust’s and Karl Larsson’s poems. Alex Mirutziu (Sibiu, Romania, 1981) belongs to a new generation of Romanian artists showing internationally. His work has been the subject of solo exhibitions at Kunstverein Ost in Berlin, Delfina Foundation in London, MLF | Marie-Laure Fleisch in Brussels, MNAC in Bucharest, IASPIS in Stockholm, The Glass Factory Lab in Boda Glasbruk, Sweden, Barbara Seiler in Zurich, Mihai Nicodim Gallery in Los Angeles, Galerie Rüdiger Schöttle in Munich and Galeria Sabot in Cluj-Napoca, Romania. 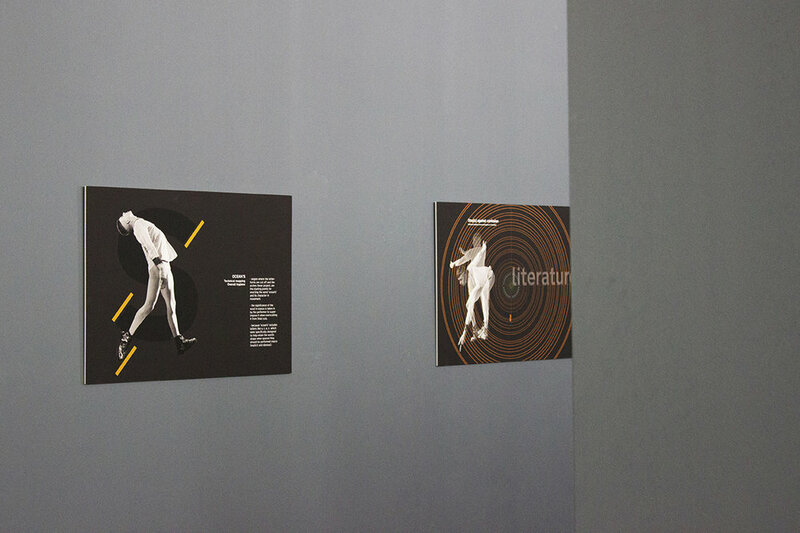 His work has been exhibited in group exhibitions at FRAC des Pays de la Loire in Carquefou, France, Art Encounters in Timisoara, Romania, Kisterem Gallery in Budapest, CCA Tel Aviv, Jecza Gallery in Timisoara, MNAC in Bucharest, Gallery 400 – University of Illinois at Chicago, Motorenhallen in Dresden, Germany, Romanian Institute for Culture and Research in Humanities at the Venice Biennale, Kunsthalle Winterthur, Switzerland, CCA Warsaw, Műcsarnok – Kunsthalle Budapest, Gaudel de Stampa in Prais, Spazio Vault in Prato, Italy, Art Gallery of Alberta in Edmonton, Canada, Power Plant in Toronto, Tranzit House in Cluj- Napoca, Galéria Krokus in Bratislava, National Museum in Warsaw, Pavilion – Centre for Contemporary Art and Culture in Bucharest, Ada Street Gallery in London, and Brukenthal Museum in Sibiu, Romania. His performances have been presented in several venues such as Block Universe at Royal Academy of Arts in Londra, Wexford Arts Centre, Irlanda, Accademia Rumena a Roma e WUK a Vienna. 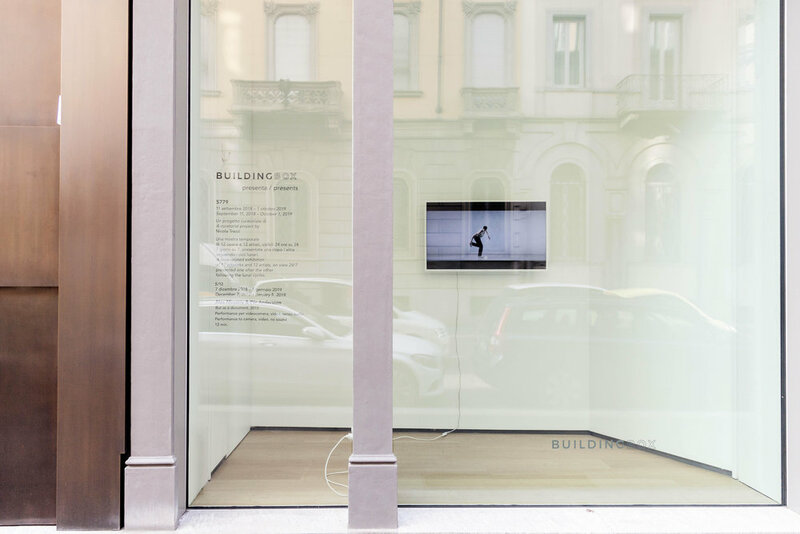 BUILDINGBOX is an independent space within the premises of BUILDING, characterized by its own unique program. The opening project, curated by Nicola Trezzi, opens on the week of Rosh HaShana, which is the beginning of the new year – the year 5779, as the title says – according to the Hebrew calendar. 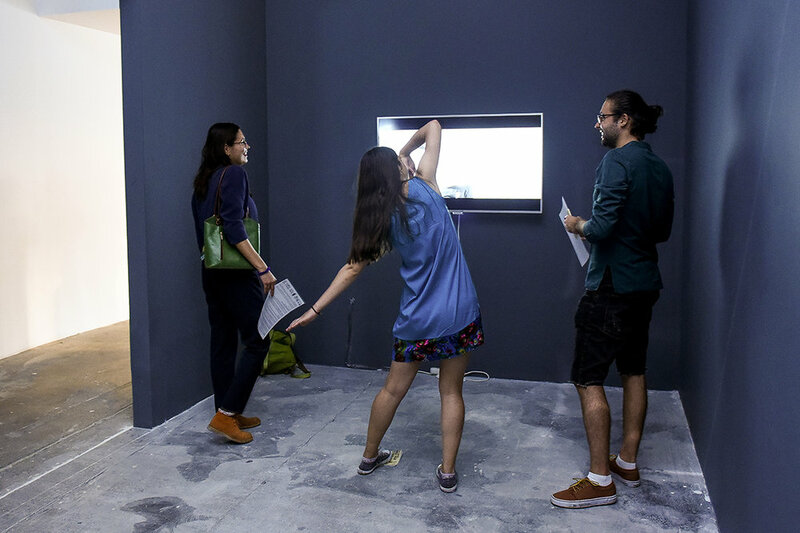 Following these premises, a window gallery which is visible 24/7, and a calendar which consists of 12 months (Nisan, Iyar, Sivan, Tammuz, Av, Elul, Tishrei, Marcheshvan, Kislev, Tevet, Shevat, and Adar), 5779 is a group exhibition in which several artworks are not present next to each other but rather one after the other. 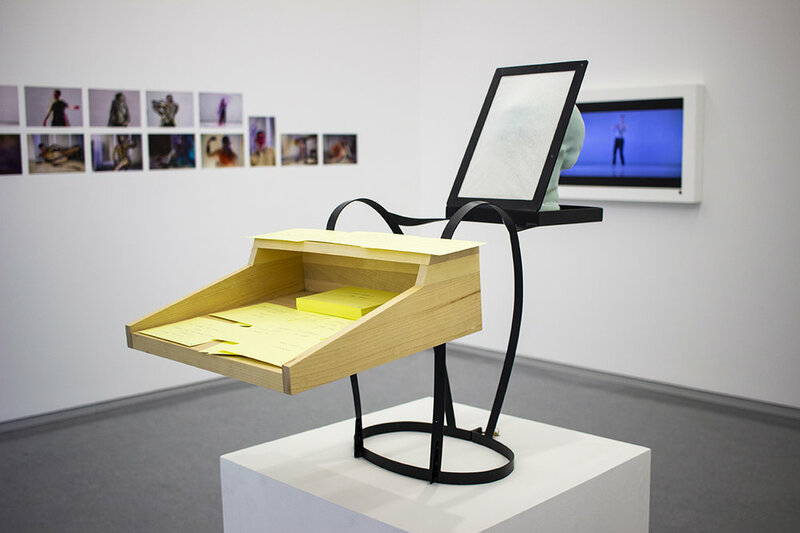 The structure of the calendar – day after day, month after month, year after year – becomes the guideline for the presentation of artworks by several artists; in doing so, this structure transforms the essence behind group exhibitions, from coexistence and juxtaposition to linearity and procession. 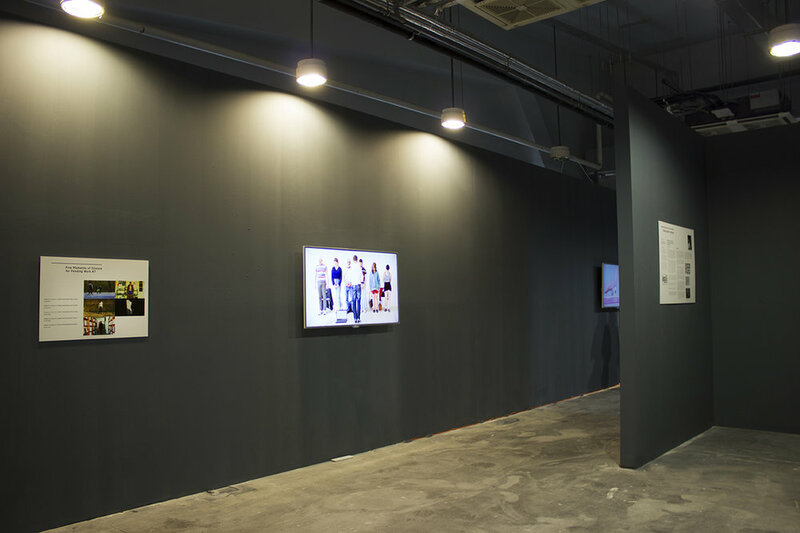 Furthermore, this specific format deconstructs the very core of the group exhibition format, which is, by definition, an exhibition in which several artworks, by several artists, are presented next to each other in a confined space and for a specific amount of time. With 5779 the idea of a group exhibition in which works of art by several artists appear, in the same space, one after the other – substituting one another, replacing one another – suggests an inversion in the equation at the base of exhibition making. Rather than rooting exhibition making into space, as it usually happens, this time the exhibition is rooted in time rather than space. Added on September 7, 2018 by Alex Mirutziu. Added on September 18, 2017 by Alex Mirutziu. - all photos by Alex Mirutziu with the exception of the last 6 in line, bearing the copyright of Doria Photography. As long as against an artwork we position ourselves frontality, we tend to do so brutally charged and equally emotional. The works in the exhibition are impossible to be perceived frontally, be it visually or multi-sensorially, but only by detour, alas slowly digesting it to the point of loosing oneself. My most recent works move away from the logic of ‘me’ - ‘here — ‘the rest’ - outside, and deal with uncertain dimensions which exhibits one/other meaning as well as with links of co-existence between multiple presences, approaches or appearances of the individual and of the world in which he/she belongs that cannot ever run out of steam. Even when ‘here’ and ‘now’ structure our understanding, these are contaminated by an act of re-installment, or re-demarcation of the creative act. Demand joining efforts, multiple foldings.I insist in creating a climate that brings forth the likes of something to be later metabolised. This selection of works are part of such a mechanism of making meaning from proximity. I’m not interested in approaching this mechanism in a critical way, rather the contrary, due to the fact that critique entails a sort of way of looking at the object from the outside, short-circuited by spilling consciousness. It has not been proved that such a way of accessing reality has ever had enough stamina to be able to arrive at the end of a demonstration. Many thanks for the thought and energy that went into production and instalment to: Simona Deaconescu (Artistic Director of BIDFF), Anamaria Antoci (Festival Manager), Irena Isbasescu (International Relations), Emilia Paunescu (Production Manager) an all the BIDFF team which made this show possible and for Ioana Paun, chief curator of performative arts at MNAC for her quick-thinking and functionalist approach. Added on February 10, 2016 by Alex Mirutziu. 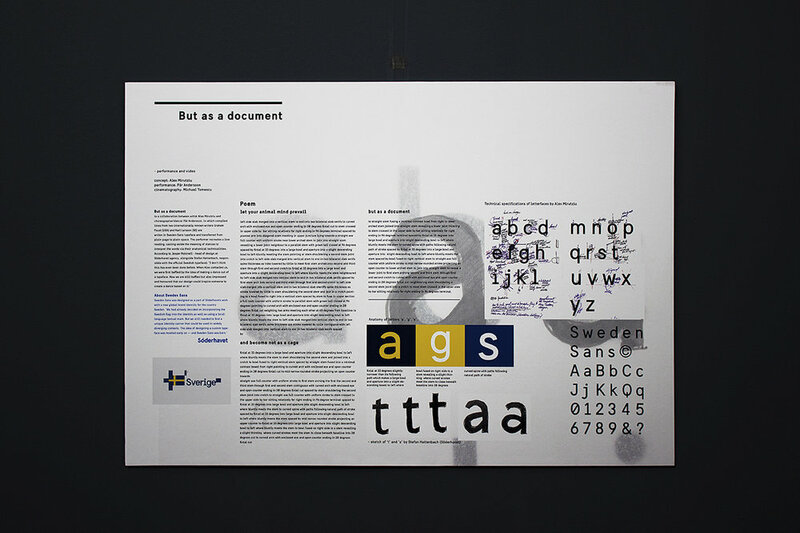 But as a document is a collaboration between artist Alex Mirutziu and choreographer and dancer Pär Andersson in which compiled lines from two internationally renown writers Graham Foust (USA) and Karl Larsson (SE) are written in Sweden Sans typeface and transferred from plain-page to plain-space. The performer recreates a live reading, shedding the meaning of stanzas, by grabbing words with their anatomical technicality. According to Jesper Robinell - head of design at Söderhavet agency, with Stefan Hattenbach, responsible with the official Swedish typeface ): "I don't think this has even been done before. 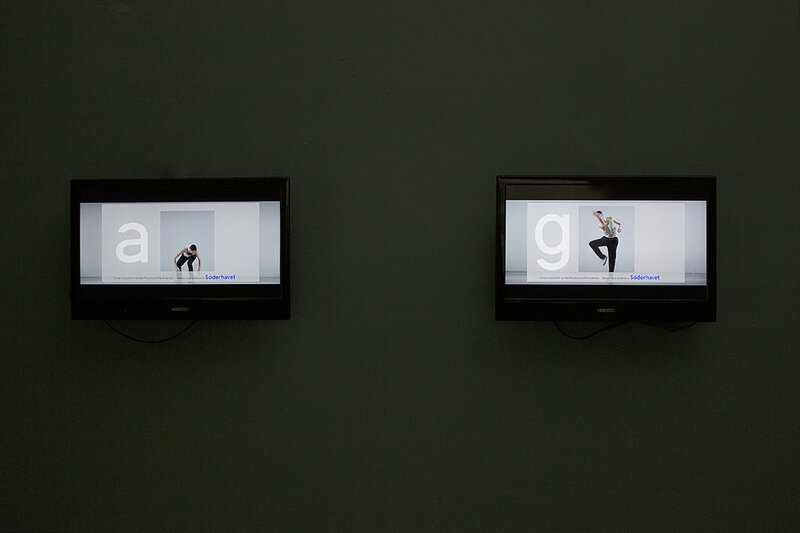 When Alex contacted us, we were first baffled by the idea of making a dance out of a typeface. Now we are still baffled but also impressed and honoured that our design could inspire someone to create a dance based on it." More about the exhibition in which "But as a document" will be presented see below. Curatorial intro: The curatorial method employed in devising “The White Dot and The Black Cube” as an exhibition in six parts takes its starting point from the investigation of three essential display formulas: two group exhibitions, two duo-shows and two personal exhibitions. Each of these formulas is enhanced by the dialogue between the two curators and by their exchanges with the artists and the museum as an institution. The group exhibitions were conceived following a theoretical impulse that one of the curators transmits to the other; the dual ones by the curators assuming one of the two conflicting theoretical positions; and the personal ones through a triangular dialogue. Set off by the imperceptible reality and symbolic processuality of the artistic gesture, I’m the Invisible Man, chapter II of the curatorial project “The White Dot and The Black Cube”, discusses the idea of invisibility. 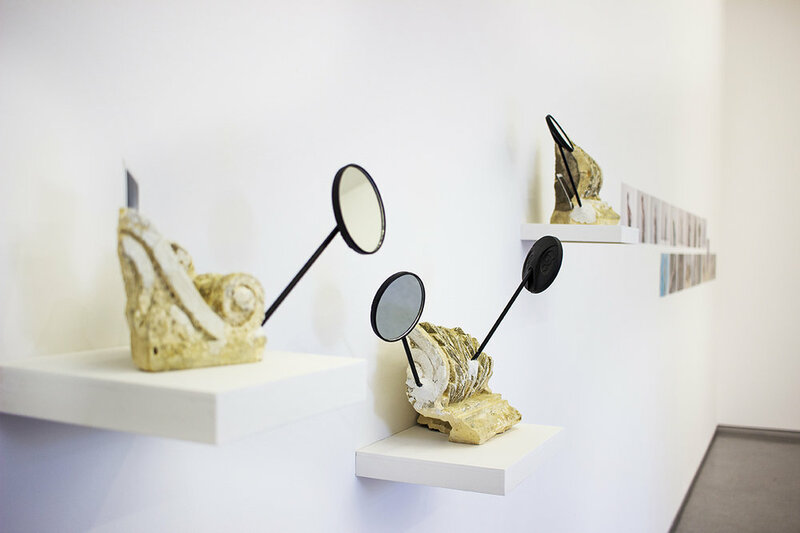 The conceptual approach of this exhibition comprises several layers of the relationship with image and matter, which most often constitute the visual hooks of a display. The artists invited to reflect upon this subject perceived the sensitive alteration of reality, which they either provoked themselves or recorded non-invasively, or adopted as such, thus opening the creative discourse towards suspense and coincidence. The duality of the interpretation of the invisible integrates both its potential to protect visible matter and the fragility produced by erasing an object from space. We believe that both can constitute possible frames of interpreting the unity and discontinuity of a curatorial enterprise. The invited artists commit themselves to the moment at which the invisible blurs the visible, at which certain planes coincide, at which the images are superimposed perfectly – man’s construction over nature’s construction, the artificial image over the natural one, and reason over intuition; the moment at which the visible body represents both a possible weapon and a vulnerability deriving from public discourses on marginality; the moment at which the white noise of the quotidian insinuates itself as “tense” materiality into our lives; and at which the residual frames of perception reach the centre of the visual field.